Comments on "On the Street...Cold Spring Layering, Manhattan"
maybe she has shoes in her bag and will change them when she gets where she is going? Maybe those are her walking shoes and she's got her stylin' shoes in her bag, and you just didn't give her enough time to switch them out? I'm diggin the background. oh i love this. Although slightly jealous as I would just look silly in something like this in the daytime. its like a toned down susie bubble style! omg i LOVE those shoes! where can i get a pair like that? i think the shoes are great! Nice photo, Sart. I particularly like the distinctive shoes. If I saw this young lady on the street, I would commend her on her effort. Good show. That is a nice bag. Anyone know where it's from? I'd absolutely wear something like this. Love the textures and the color scheme is perfect. I really like this outfit...it's almost like an art project collage with coloured tissue paper and wool and tin foil (does that translate transatlantically??) and some black pen. I also think the colours are beautiful. A fun, casual look. She looks comfortable. Too bad she didn't check the weather report before leaving the house. It's a shame she has to carry that big coat. looks like a DIY skirt! impressive. There are a couple different outfits in this. The shoes, leggings, and gold create one. The blue is a pastel and doesn't match that, but could go with the coat. The sweater goes with the coat, but not the blue or the gold. The shoes go with the coat as do the leggings and gold combined add a white, tan, mustard, or burnt umber shirt. The bag works with that too. Is it possible that I'm the only woman who doesn't like metallics this season? To the first poster, a corrction in terms - those are NOT leggings. They're opaque tights and make a big difference paired with the outfit. Leggings would not work. I like the outfit except for the shoes, those are horrible!! fabulous!! my favorite in so long! the funny thing is though, that i thought the detail shot was of a sleeve!! you are far better than facehunter. just want to pitch that in there. Does anyone know where the bag comes from? Or the other pieces of the outfit for that matter? the bag is botkier for whoever was wondering. While I would not wear this particular outfit in a millennium, I find it so inspiring. 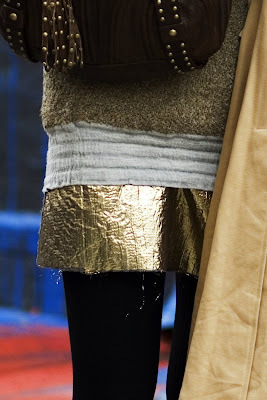 I love the attention to different textures and colors and how she repeats the metallics in the skirt and bag. She clearly sees dressing in the morning as a creative endeavor and personal expression, not just something she has to do to avoid prosecution for indecent exposure. I'll be thinking of her when I'm standing in front of my closet tomorrow morning. that detail shot is just gorgeous. i would be completely in love with this outfit if she wore it with heels or flats but those shoes ruin it for me. The metalic is so wonderfully unexpected. I love the shoes, but with a different outfit. The shoes bring it back to high school a little bit. I do, however, love zebra print. it seems like she's accidentally fashionable. like she is someone who just puts on whatever and it just comes out looking great. I really adore the bag. I think she looks great. I love all of the different textures. It's a fun mix. I'm just sorry that she had to lug that coat around. Maybe some sort of lightweight anorak would've been better? And I LOVE her bag! It calls to me like a siren. I agree with the sweed, those shoes are ick. i love Kate's comment about how this looks like an art project collage. Whenever you put color next to black it looks horrible. this is pretty fly because the shoes are out there too but it all seems fairly subtle and understated. I love how all of the colors just work togeather. I love this look! I actually tried to pull something like this together last week and as I arrived to pick the kids up from school (trying to be a somewhat funky mama) a couple of people commented: "Did you walk today?!". Surely groovey trainers and tights have sartoral rights, not merely as go-betweens? guys, the shoes are from brazilian designer oskar metsavaht (check out a lotta good stuff at osklen.com). u can find them at osklen stores in nyc (meatpacking district and soho). I like the shoes with that outfit. It sets off all the gold/yellow/brown in the rest of the clothing. That's a shame that you were mistaken for a jogger! I know tights can be difficult to work into an outfit without looking like you're going running. Very interesting dress. It is so nice to look at. Did she make it? Or does anyone know the shop/designer? Thanks! I love this outfit! - but there are a few little things that make it less appealing. For example, the lower waistband does create the illusion of shorter legs, and there is no waist to balance it!!! None-the-less, the textures are absolutely fabulous & a v. cute ensemble. It's funny how the color of the hair can complement an outfit so well. I don't think it would have worked all that well if she would have had, lets say, blond hair. it's all about dressing in the colors that works for you.. Illusion of short legs? (anonymous above) Yeah maybe, but my guess is that if her legs look shorter, that's because she is short and that "illusion" often happens when a short person wears sneakers like that. (I know cuz I have almost exact same body type as hers, trust me having a higher waistband does not cure it) But you know, heck who cares if your legs look a little short. Not everone's 5'10'' and I think part of have personal style is really about not being afraid to appear a little less perfect than say, Carolyn Murphy. Look at Kate Moss, her legs a little weird, but she's nonetheless so beautiful. Our current conceptions of beauty tell us that you need a bit of imperfection to be perfectly beautiful. amen to anon 6:22 - I really think the illusion of "short legs" really suits her; she looks adorable! I don't think everyone should have to look like they have mile-long legs. I love her outfit, and she is a dream. She looks like a studious young lady from the 1960s. So young and so free. Timeless.